Simon met with representatives from the firm last summer when they discussed the possibility of signing a capacity funding agreement. Since the 4,600 kilometre pipeline is slated to pass through Kanesatake, it’s vital for TransCanada not to encounter active resistance in the Mohawk territory. Representatives from TransCanada would not comment on Simon’s claim due to “reasons of confidentiality,” the company said in a statement emailed to the Gazette. However, one person who participated in separate capacity funding negotiations said that while the agreements come with certain confidentiality clauses, they do not prevent a First Nation from opposing the pipeline. Pending approval by the National Energy Board, construction on Energy East is set to begin in 2020 and TransCanada says it simply wants to engage with aboriginal territories along the pipeline. But TransCanada does not disclose the names of all of the First Nations it engages with. The assumption, according to the source, is that band councils may not want the public to know they’ve accepted money from a pipeline manufacturer. TransCanada wrote Kanesatake a $15,000 cheque last year to open a community consultation process, according to Simon. The chief says he gave the money to a consultant but because of his own opposition to the Energy East project and widespread resistance throughout Kanesatake, he stopped meeting with the energy firm. The company also donated $10,000 to the Mohawk Council of Akwesasne last year to develop a new walking trail in the forest on its territory. TransCanada signed a letter of agreement with Akwesasne in 2014 and it will help fund a traditional land use study of the Mohawk territory affected by the pipeline. In all, TransCanada will fund 43 similar studies on territories along the pipeline — which will link the Alberta oilsands to terminals in Quebec and New Brunswick. 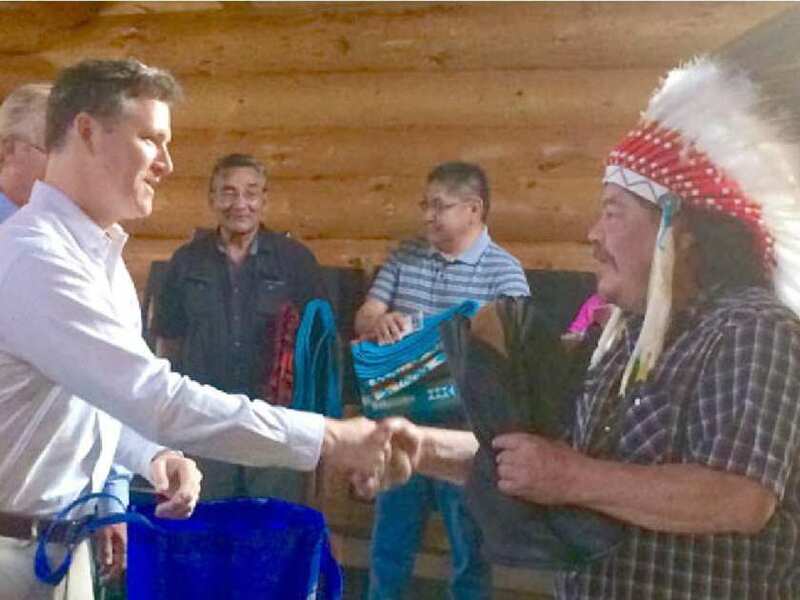 In the latest deal between TransCanada and an aboriginal group, the company announced Wednesday it signed an engagement agreement with the Grand Council of Treaty 3 — which represents 24 First Nations in northern Ontario. Though terms of the contract are confidential, some details were leaked to the Gazette by a third party who obtained a stolen copy of the document. The agreement would see TransCanada fund a $700,000 environmental assessment of the project and its effects on the Treaty 3 lands. There are confidentiality clauses in place but Treaty 3 First Nations are free to oppose the pipeline and reject future deals with TransCanada. It’s difficult to track the specific dollar amounts and other terms agreed to in these contracts given that the National Energy Board doesn’t regulate or oversee this practice. But the exchange of donations for access to chiefs, council and community members is par for the course in the energy industry. Before the NEB approved Enbrige’s Line 9B pipeline proposal, the community gave $1.15 million in grants to communities along the pipeline — including a number of First Nations. The money went mostly toward emergency intervention equipment. For some First Nations leaders though, no amount of money or cooperation from TransCanada would be enough to sign a funding agreement. Nipissing grand chief Marianna Couchie says she worried about the ethical implications of accepting money from a pipeline company when she was approached by TransCanada last year. Defending her point, Couchie spoke of the Nexen pipeline rupture this month, which saw 31,500 barrels of bitumen ooze into a Northern Alberta bog. Reports suggest the leak may have gone unnoticed for two weeks. “This is, and will continue to be, an integral part of everything we do at TransCanada,” the company said in an email to the Gazette. In its pursuit of having the Energy East project approved, TransCanada has held 1,700 meetings with 260 aboriginal communities since 2013. The company also spent $66.5 million on aboriginal businesses, goods and services for its construction projects in 2013 and funds various First Nations business and training initiatives. Posted on July 31, 2015, in Indian Act Indians, Oil & Gas and tagged Energy East, Energy East Pipeline, oil and gas pipelines+Indigenous resistance, TransCanada. Bookmark the permalink. 3 Comments. All the big smiles with hands full of shiny baubles!